This short hike goes over two beautiful rivers to a gorgeous meadow near the Tuolumne Meadows Lodge. Take the spur trail south to the John Muir Trail and make a left to follow the Dana Fork upstream. The trail follows this lovely river up to a bridge. After crossing the bridge, the trail gently travels up and over a wooded ridge that separates the Dana Fork and the Lyell Fork. 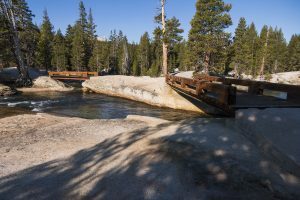 The trail breaks out to slabs of granite with twin bridges spanning the river. Cross the bridge to the lovely meadow on the other side. For a longer day, consider heading further up Lyell Canyon to more beautiful meadows (see Lyell Canyon).